1.2.2 How do you get Reduced Juice? 1.13.1 How does 5Dimes poker score? 1.13.2 How are the actual poker games? When you first lay eyes on the 5Dimes website, there’s nothing that tells you that, in my opinion, this is the best offshore online sportsbook there is. The 5Dimes design is at least 15 years old, with a betting interface that resembles Excel and complete with an animated logo for crying out loud. The 5Dimes bonuses are stingy compared to the bigger sportsbook names. The 5Dimes navigation is confusing and there isn’t even a search function to find games by team name. In fact, I recommend that beginning sports bettors who want to make an occasional bet or two should probably steer clear of 5Dimes. Beginners will probably get intimidated by the 5Dimes interface and they can get a better bonus at another sportsbook. 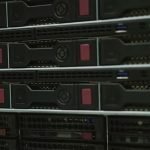 5Dimes isn’t flashy or easy to understand for beginning sports bettors, but Reduced Juice gives the undisputed best line prices online from any sportsbook. However, for intermediate and advanced sports, 5Dimes shines with the only things that matter to you: the most lines, the best prices, and they don’t give winning players any grief about cashing out. Their Reduced Juice system is unmatched, literally saving even smaller bettors thousands of dollars per year. Reduced Juice is the best promotion at any online sportsbook – period. Check out these odds in the 5Dimes Reduced section. You’ll save anywhere from 1-9% on the standard price given by almost every other sportsbook. That adds up to thousands saved per year for regular bettors. There’s a reason that 5Dimes is the go-to sports book for sharps and anyone who takes sports betting seriously. It’s ugly and a little confusing, but 5Dimes is the cheapest and most reliable USA-facing sportsbook online. They also don’t screw around with payouts. I sampled a number of different online sportsbooks before seeing 5Dimes constantly recommended by veteran bettors. Even though 5Dimes has been online since 1996, I didn’t have any expectations going into this review, good or bad. After playing there myself, the sampling can stop. The Reduced Juice system is the crown jewel at 5Dimes. It’s absolutely the reason I place almost every bet there instead of another sportsbook. If you bet regularly, Reduced Juice will save you thousands of dollars per year. Every sportsbook, including 5Dimes, whether it’s online or in a casino, takes a fee on every bet you make. That fee is called the vigorish, vig, or juice. The standard juice taken by the sportsbook is 10%, which you’ll see in a betting line as -110. That means that you’re paying $110 on a bet to win $100. With 5Dimes Reduced Juice, to win $750 I only had to pay $792.50. Compare that with $825 it would cost at another online sportsbook posting -110 prices and you see the immense value. That’s a big way that sportsbooks make their money, regardless of how the games end up. Sportsbooks aim to make bets even on both sides of games and simply get rich collecting the juice. 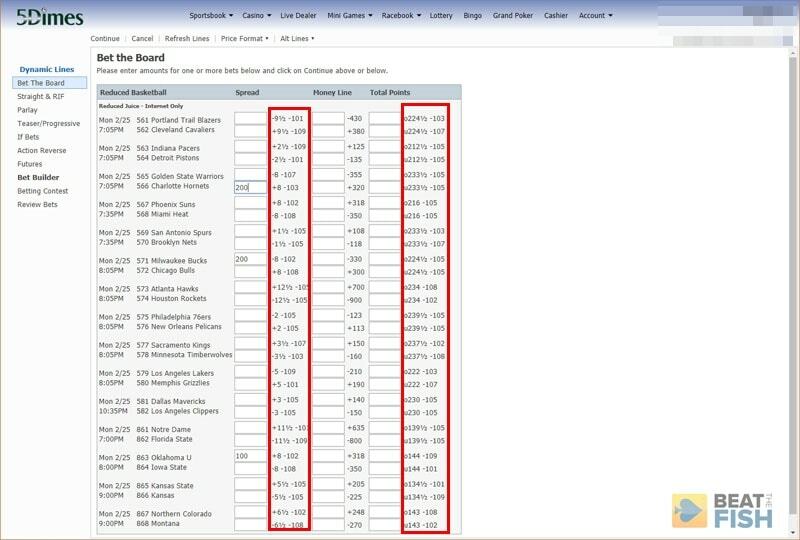 Almost every online sportsbook aimed at novice bettors posts every standard spread line odds at -110 or worse. While I’m a big fan of Bovada, for example, their lines are way too expensive, regularly listing some sides at -115, which is 15% juice. It’s tough enough to win consistently betting on sports, but if you’re paying 15% just to play, it’s that much tougher. Here’s a sampling of some of my Reduced Juice lines, which 5Dimes shows in a handy summary board. You just can’t beat prices as low as -101 or -102. It’s dirt cheap and it saves you a ton of money. With Reduced Juice at 5Dimes, you’ll never see odds worse than -108, with many lines listed at -102 or even -101. I found the average to be just about -105. That 5% savings on every bet is huge! If you’re betting $1,000 total a day, that’s $50 less in vig right off the bat. That’s $350 saved in a week, $18,250 in a year just by using Reduced Juice at 5Dimes. I would estimate that 95% of NCAA games are in Reduced Juice. 5Dimes doesn’t put “Extra” college games there, but those are only a handful of games each gameday. Aside from the occasional specialty bet like a first-half bet or a team total, I place every bet at 5Dimes through the Reduced section. Now, you might not be betting $1,000 a day, but the fact is you save money every time you bet. Regular bettors shouldn’t be living without this and will see the most value from it. However, even if you’re making a one-time bet on the Super Bowl, why not increase your winnings 2-8%? How do you get Reduced Juice? 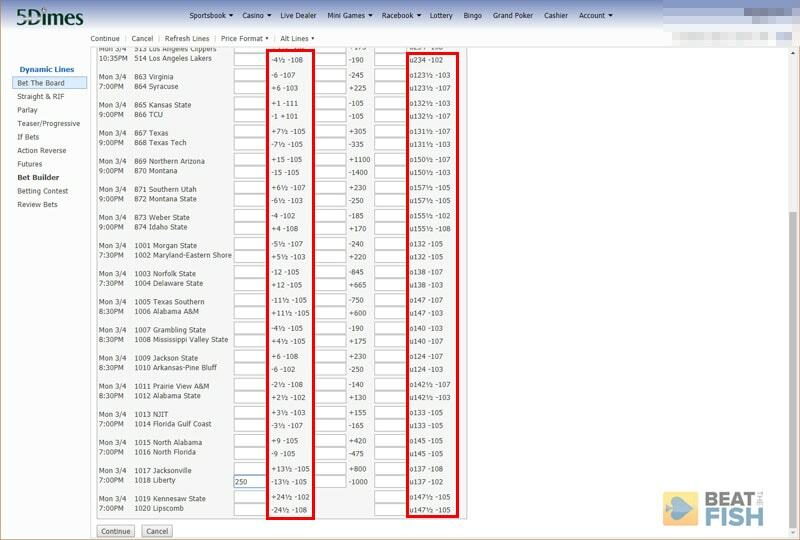 Just look for the “Reduced” box under each sport in the 5Dimes Sportsbook Main section. Select it, click Continue, and you’ll almost every game on today’s schedule at reduced line prices. Beautiful. There are a few caveats to Reduced Juice. It’s only available on game day, meaning you won’t see any games listed for future days. I found that 5Dimes puts the new slate of daily games in Reduced either at midnight EST or before, so you won’t be waiting around in the morning for them to post the lines, unlike some other sportsbooks. 5Dimes doesn’t make it very clear, but you want to look in the Reduced section under each sport to see the improved lines. You also can only place spread bets, moneyline bets, or totals bets in Reduced. You’ll need to go to a sport’s normal section for things like first halves or team totals. You also can’t get Reduced Juice on things like teasers or parlays. For me, that’s fine as standard bets are a vast majority of what I play. Reduced Juice also has a limit of $500 per bet, or $1,000 for NFL games. It’s tougher to see the whole list of sports at 5Dimes on mobile, but just find the same “Reduced” section under each sport. When it comes down to it, the only two things that really matter to regular sports bettors are making the most money and being able to cash it out. Reduced Juice at 5Dimes helps the former immensely, giving you a 5%+ larger edge on every bet you make. You’ll be getting a 50% (or more) discount than other sportsbooks. That’s huge. I might sound gushing, but what else can you say about something that makes that much of a difference in your bottom line? 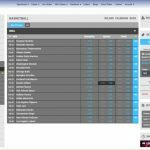 Even though it may not feel like it, 5Dimes is one of the most cutting edge sportsbooks when it comes to the release of betting lines and the number of lines offered. I dare you to find a sport 5Dimes doesn’t offer betting on. You’ll also be hard-pressed to find another sportsbook that releases lines and odds as quickly as 5Dimes does. That can be especially important in college basketball, with small conference “extra” games often delayed or even not offered at smaller books. Aside from the obvious major American sports leagues, 5Dimes has lines from every country around the world and an absurd number of sports. Soccer alone has lines from 50 leagues around the world, basketball has another 15, hockey another 10. I can’t think of anything 5Dimes doesn’t offer lines on. I’m almost embarrassed every time I log in to 5Dimes and see Little League baseball future lines. True degenerates will feel like they’ve died and gone to heaven. The number of lines at 5Dimes in unmatched both in the number of sports offered and the lines offered on each game. There are also tons of player and team prop lines on every game, with very specific lines available such as the first team to score 10 points. 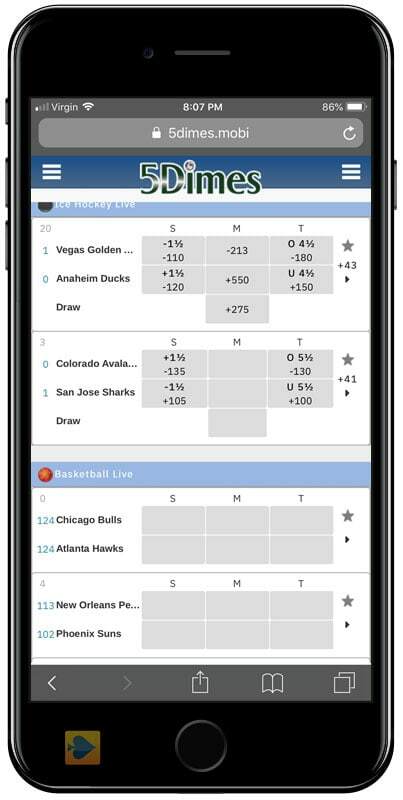 5Dimes also offers lines on portions of games, such as the first 10 minutes of a college basketball game or the first period of a hockey game. These are the specialty of some bettors who have built profitable models for partial-game action. Not every sportsbook even offers these lines. The Other Sports section encompasses things like esports, cricket, rugby, and non-sports categories like politics, Oscars, and competitive eating (truly). 5Dimes offers a lot of very specific betting lines that not all sportsbooks do, such as 1st period for hockey or all the way down to first 5 minutes in college basketball. I’ve heard a number of other bettors say they can’t get on a favorable line because their book doesn’t put up lines until later in the day. I’ve never had that trouble at 5Dimes, who puts up the following day’s lines in the middle of the evening as West Coast games are winding down. I prefer the good old Sportsbook Main, which is reminiscent of an Excel spreadsheet. It’s the easiest to read on these aging eyes, and lets you input your bet amount right next to a line. More modern formats make you click to add a bet to the bet slip and then enter your wager. Sportsbook Main is also the only way to see the Reduced lines all together in one place. It’s probably the most stripped-down online sportsbook interface I’ve seen, but 5Dimes and the Sportsbook Main section gets the job done. Pro tip: turn your phone sideways to see everything without having to scroll sideways. The Sports Betting Prime format is reminiscent of other modern sportsbooks and may be easier for some bettors to work with. You’ll see the list of sports on the left, you can mark your favorites, and it has a traditional bet slip. 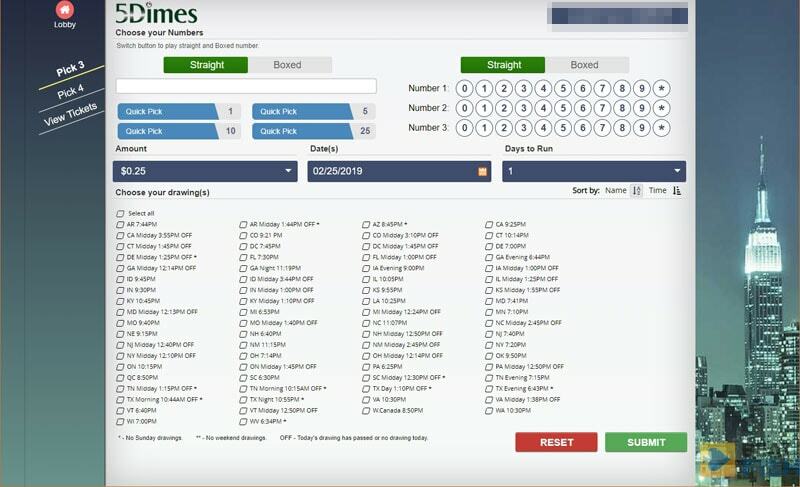 The Sports Betting Prime section at 5Dimes looks more like the layout at other books, but I don’t like the functionality or occasional lack of reduced price integration. 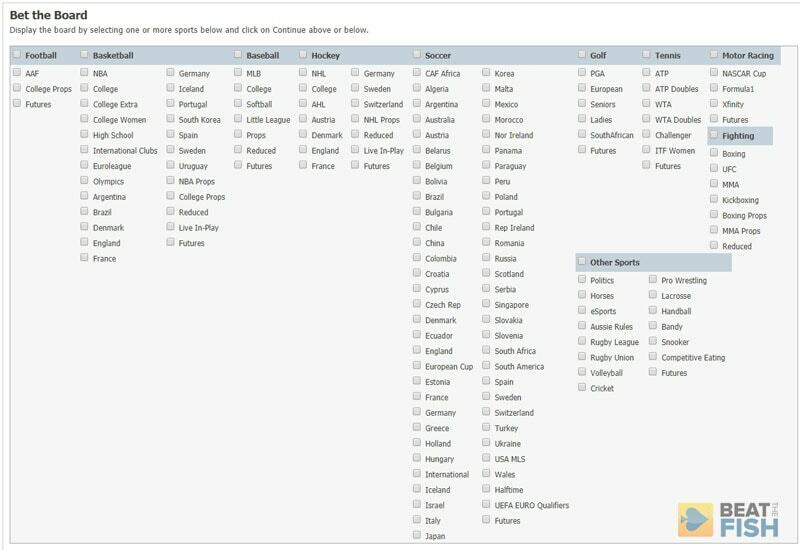 I’ve found 5Dimes to be hit or miss when it comes to incorporating the Reduced Juice line prices into Sports Betting Prime, so I still recommend just using the Sportsbook Main and going to the Reduced section for the best odds. Live Betting has become a phenomenon in recent years as the popularity of sports betting has intersected with our phones becoming an extra appendage permanently affixed to our bodies. You can be sitting at a game, or out at dinner, or on the sofa watching a game, and get in a bet on a game in progress at 5Dimes. You might feel confident in how a game is going to play out from having watched it for a while or due to a key injury. 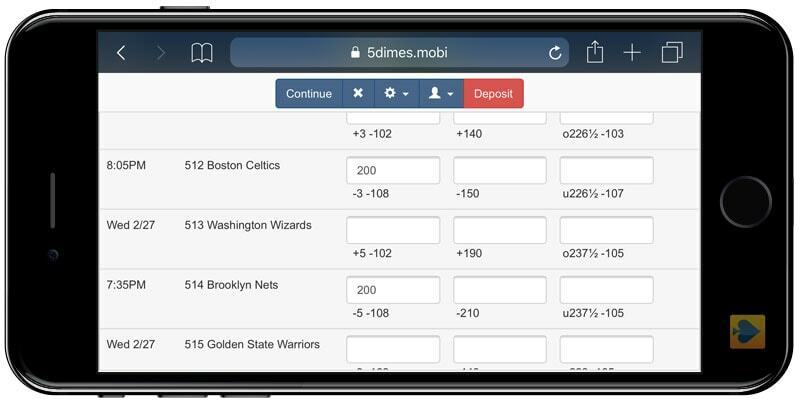 The 5Dimes mobile live betting interface looks fine, but I’ve had a lot of trouble actually getting bets in successfully. In-game live betting can also come in handy if you can’t get a bet in before game time, but want to make it after the game has already started. 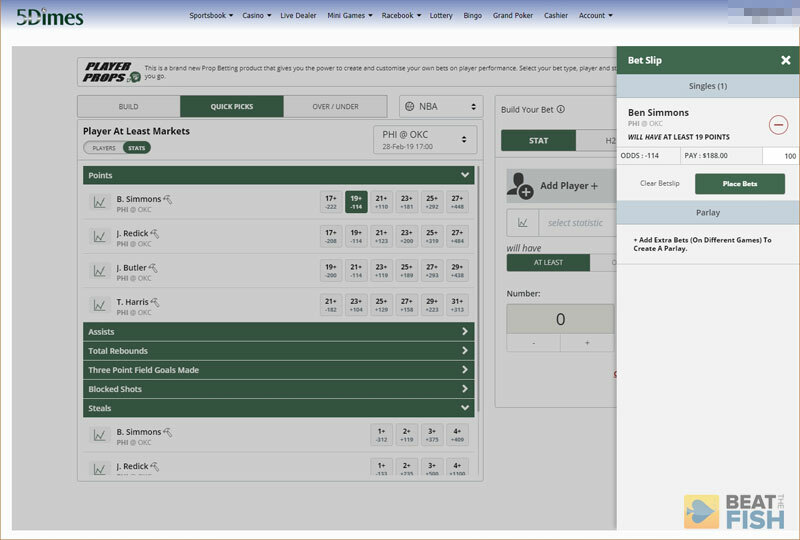 Live betting odds are computed on the fly as the game plays out, so every play changes the odds. Savvy players even watch live betting odds to get better spreads on games they were going to bet anyway. For example, if a -10 heavy favorite basketball team goes down 4-0 after tip, they might get their line dropped to -6 or better. 5Dimes has a ton of in-game live betting options, but stick to doing it on a desktop if you can. I often get server errors if I try to do it out of the house. 5Dimes has 2 different interfaces for live betting, which you’ll see as Live Betting Extra and Live Betting Ultra. They look slightly different, but both serve the same purpose. 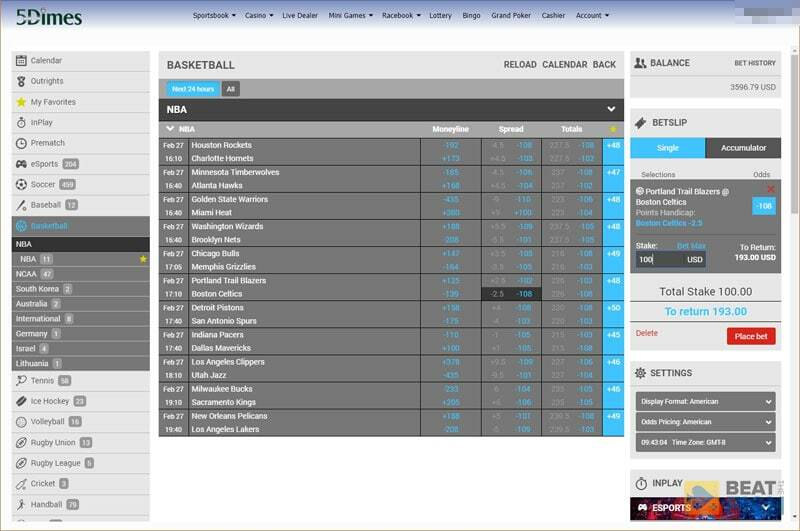 You can see live game scores and select spread, moneyline, or total odds on each. Some sports bettors are really good at waiting out improved odds on live betting. For example, Milwaukee easily covered the large spread in this game, but you could get them at -5.5 if you placed a wager when the game was still close. The biggest problem I have with 5Dimes live betting is that it often gives me errors when loading on mobile, which is probably the way most players will be live betting. In-game betting on desktop still seems to work without issue. My brain doesn’t work fast enough to do live betting often, but for those that do, 5Dimes might not be good enough unless they improve the system. Although it’s nice to have so many choices, the most important thing to keep in mind is that you lose your Reduced Juice if you claim any of the other bonuses. The Reduced Juice is so valuable for regular bettors that I can’t imagine a scenario where you’ll come out ahead by giving it up. 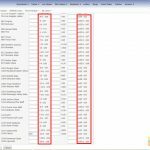 I detailed Reduced Juice in detail above, which gives you excellent prices of -101 to -108 for spread, moneyline, and total wagers the day of a game. 5Dimes automatically places new players into the Reduced Juice Rewards program, which is their best bonus. You don’t need to do anything or use any sort of 5Dimes bonus code to get Reduced Juice. Just sign up, make a deposit, and you’ll start seeing the reduced odds. If you opt out of Reduced Juice, the Free-Play Rewards is the second-most popular bonus at 5Dimes. It’s a standard extra money bonus that almost every sportsbook offers. You’ll get a 50% Free-Play bonus on deposits up to $400 for a maximum of $200. If you deposit more than $400, you’ll get another 20% on deposits up to $2,000. That means you can earn a maximum of $520 in Free-Play money if you deposit $2,000. The 50% bonus at 5Dimes is decent, but you’ll no longer get Reduced Juice if you take it, which is the best part of the sportsbook. The worst part of the 5Dimes Free-Play bonus is that you can’t wager with the bonus money right away. The Free-Play money is released in 10% increments every time you wager your deposit amount once. This is similar to how most poker sites release their bonuses. That makes it a 10x total rollover to see all your bonus money. Most sportsbooks credit you with your bonus money right away and then require you to roll it over before withdrawing it. That way, at least you can use the bonus money to increase your bankroll right away and use it for wagering. 5Dimes does it in reverse, making you roll it over before you get access to the money. Keep in mind that if you want to get the Free-Play or any other bonus at 5Dimes besides Reduced Juice, you’ll have to manually request in within 24 hours of your deposit. You can use email, live chat, or telephone to do that. It’s an old-school requirement that reinforces why you should just stick with Reduced Juice. The Free-Play bonus can be claimed with reload deposits and you can also request it for use in the Match Play Casino rather than the sports betting section. 5Dimes does has a number of different promotion rewards you can choose between, but I always recommend that players just stick with Reduced Juice. The Cash Back Rewards system gives you a rebate of your 5Dimes losses. You can claim 10% once a week, 15% once a month, or 20% twice a year. As you don’t aspire to be a losing player, let’s hope you don’t want to claim this. This bonus gives -107 lines for both standard wagers and parlays. Since you already get this or better with Reduced Juice, the only 5Dimes players I could imagine this being useful for are heavy parlay bettors. Again, keep in mind that if you claim any of these bonuses, you lose out on the daily Reduced Juice. The Point Mover Special gives reduced prices on buying points. I rarely, if ever, buy points on sports bets, which are largely akin to taking insurance in Blackjack. Even if you do, I doubt you buy points often enough to base your entire bonus around it. Similar to the rebate on sports losses, this bonus does the same for 5Dimes casino losses. You can get a 14% rebate on Wednesdays, 7% on any other day of the week, and 21% once per month. How random is that? This bonus is painful to think about. If you make 7 deposits at 5Dimes and lose them all without requesting a payout, 5Dimes will give you the 8th one for free. If you lose that one, they’ll give you the 9th for free as well. This can be up to $5,000 if you’re in North America. Let’s just move on. 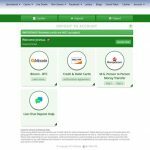 The Free Payout Reward will allow you $40 in withdrawal fee credits per month, which equals one check. If you’re requesting withdrawals via Bitcoin, as I hope all players are at this point, this is irrelevant as all Bitcoin payouts are already free. Even if you aren’t using Bitcoin, you should be saving more than $40 per month in lower line prices if you just stick with what 5Dimes already gives you with Reduced Juice. 5Dimes is most popular with American sports bettors, which is reflected in their deposit methods. 5Dimes doesn’t charge any fees with any of those methods, although cash transfers from the likes of WU always come with exorbitant fees built in. 5Dimes offers just about every deposit method still used by American players, but you’re doing yourself a disservice if you don’t stick with Bitcoin. If you have to make a deposit by credit card, 5Dimes has been online for more than 20 years. They know their way around the payment processing charade and how to get money from US players. 5Dimes can process at least 75% of credit cards without your bank declining it, which is a very good rate. The final deposit method at 5Dimes involves mailing them a money order, which is sort of charming in a mid-2000’s kind of way. If you can’t use Bitcoin and you want to stay anonymous with your bank, a money order could come in handy. Credit, debit, and prepaid cards are accepted at a high rate at 5Dimes if you need to use them. 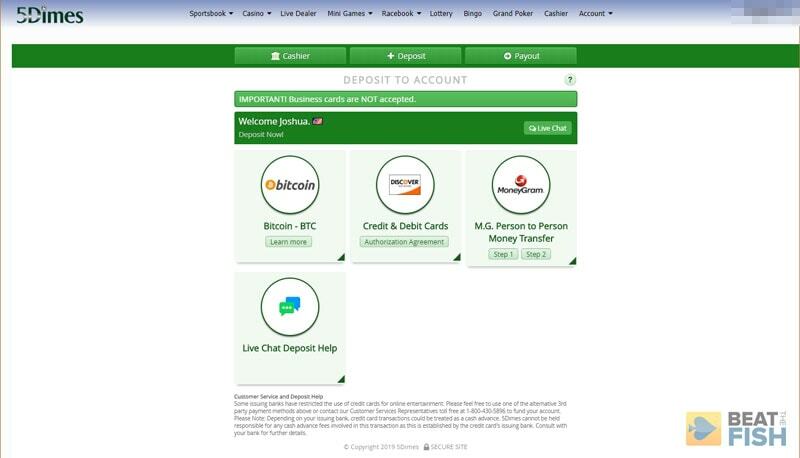 As I do with every betting site these days, I deposited at 5Dimes using Bitcoin. If you don’t, you’re doing yourself a disservice. I recommend Bitcoin to players at every turn, thanks to greater privacy, lower minimums, lack of fees, and inability to be declined. If you’re intimidated by Bitcoin or have any questions about how to use it, check out my mega-guide that explains absolutely everything. 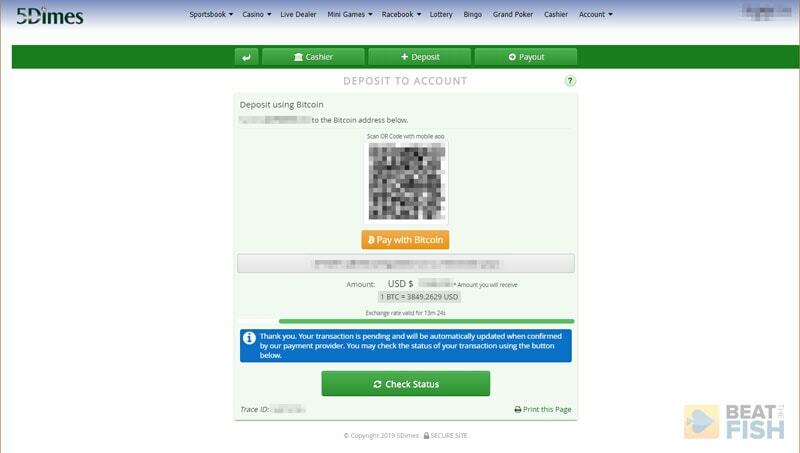 Bitcoin deposits at 5Dimes work just fine, with a standard system built into the cashier. You input how much you’d like to deposit, 5Dimes gives your a QR code and Bitcoin address to send it to from your wallet, and you’re done. The Bitcoin deposit system at 5Dimes is easy to use and built into the cashier, which is what you’ll see at most sportsbooks these days. Rarely, I’ve had some sportsbooks (e.g. Bovada) credit my account as soon as I send them the Bitcoin, and 5Dimes has done that as well on some of my deposits. Some of my Bitcoin deposits at 5Dimes were credited in minutes before they were fully confirmed on the Bitcoin network. That’s an excellent perk, although they also sometimes wait up to 30 minutes for it to fully confirm. 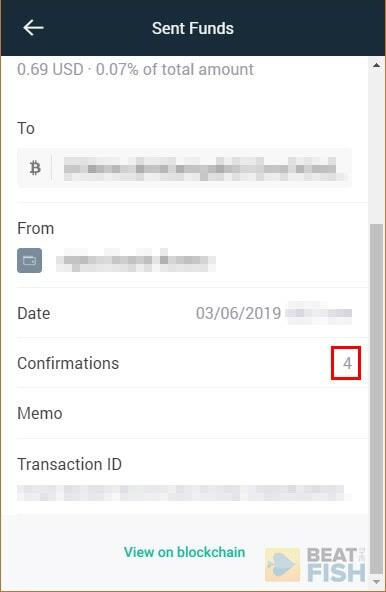 Even though a Bitcoin transaction is usually considered confirmed with 6+ confirmations, 5Dimes often credits your deposits before that point. This deposit was credits to my account with only 4. 5Dimes doesn’t give any indication that your deposit is pending, so that’s always a tense 30 minutes. Logic always helps me, though, as if you scanned a QR code or copy-pasted the Bitcoin address, there isn’t really any way it could go wrong. 5Dimes has some interesting rules about Bitcoin, which you should be aware of before you make your first deposit. 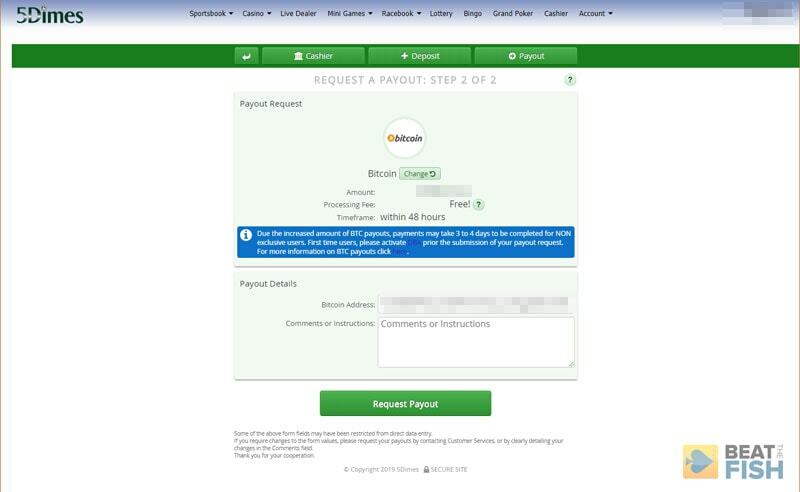 You can only withdraw winnings from 5Dimes using Bitcoin if you use Bitcoin to deposit exclusively. 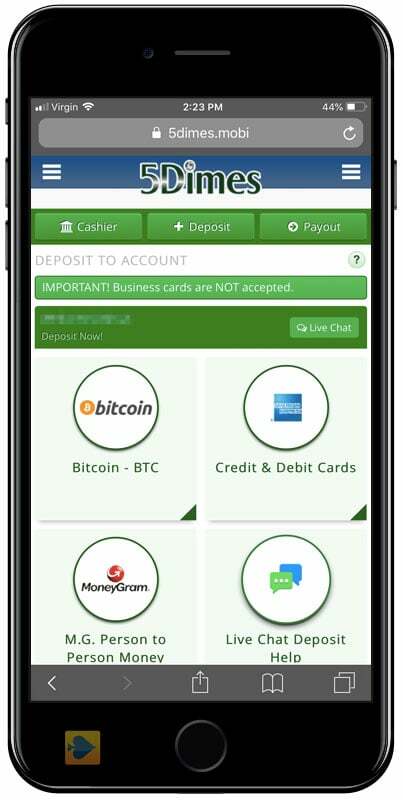 For example, if you make a deposit of $1,000 using Bitcoin and then work it up to $5,000, you can withdraw it all using Bitcoin. The same goes if you make 3 Bitcoin deposits. However, if you use a credit card to deposit $500 and Bitcoin to deposit another $100, you can only withdraw the $100 via Bitcoin. The lesson here is that if you want to get normal payouts from 5Dimes using Bitcoin, only use Bitcoin for deposits as well. Will the sportsbook get shut down and/or disappear with my money? If I’m a winning player, will the sportsbook do everything in its power to stiff me? With 5Dimes, you don’t have to worry about either. While anything is possible with the corruption incarnate that is the US government, 5Dimes has stayed operational for more than 20 years as a US-friendly sportsbook. One of the biggest draws of 5Dimes is that they won’t mess around with payouts, even from professional winning players. The cashier’s check withdrawal is high at $1,000, so smaller players should use Bitcoin. 5Dimes has survived the assault of the UIGEA in 2006, Black Friday in 2011, and constant behind-the-scenes efforts from US-based gambling companies to take them down. 5Dimes is going to be one of the last offshore sports betting sites standing. They’re like the cockroaches after the nuclear apocalypse… in a good way. 5Dimes also hasn’t survived this long by stiffing winners. The bigger sportsbooks have made a lot of regular bettors and winning players gun shy. I’ve heard from a lot of sports bettors that have suffered interrogations or downright theft because of following specific betting models. 5Dimes has a strong history free of that sort of garbage. I’m not an extremely-high volume sports bettor and I know I’m not the biggest winner around, but I had no issue with my Bitcoin withdrawal from 5Dimes. My biggest dread was how 5Dimes would treat my first payout, which is usually the worst with sportsbooks – or any betting site for that matter. It tickles my cynical funny bone that online gambling sites will accept thousands of dollars in Bitcoin deposits without any sort of KYC nonsense, but as soon you want your money, then you’ve got to send them everything short of your dental records. I guess verifying your identity only matters when the money flows out. 5Dimes quotes 48 hours as the timeframe for Bitcoin withdrawals, but I never even wait 24 hours to get mine. Perhaps it helped that I had played for a couple of months at 5Dimes and wagered my deposit many times over, but 5Dimes sent my Bitcoin withdrawal in 22 hours after confirming my phone number. Although it took a couple of minutes of talking on the phone, I appreciate the extra step 5Dimes takes to make sure it’s really you and your Bitcoin address they’re sending money to. 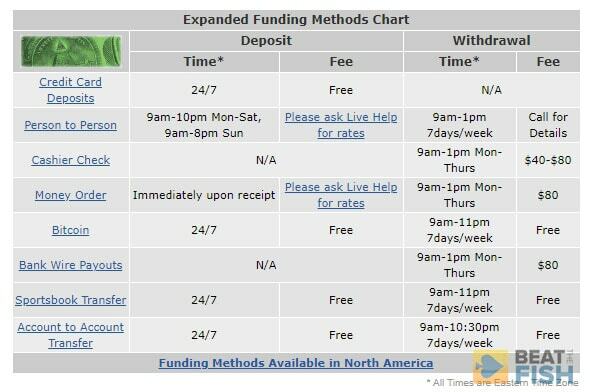 5Dimes has an archaic system where Bitcoin withdrawals can only be processed in certain hours of the day. I’ve seen this at a few other gaming sites as well. Again, the cynic in me wonders why it’s fine to automate incoming Bitcoin 24 hours a day, but not when they’ve got to pay it out. 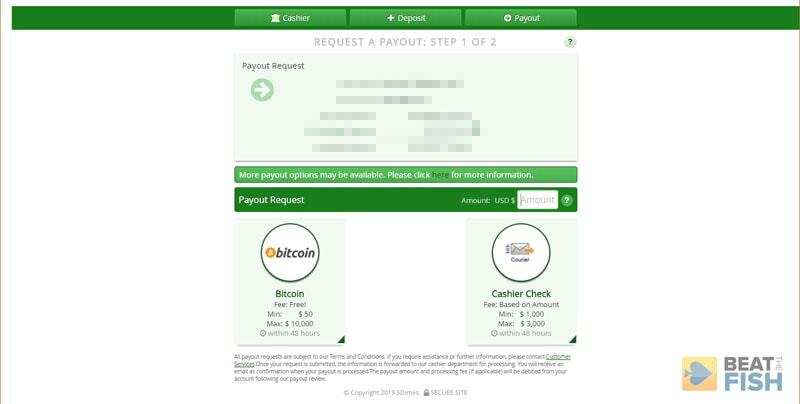 For Bitcoin payouts, 5Dimes goes through a lot of verification procedures. Besides device-based authentication, be prepared to talk to them on the phone after requesting your payout. The actual Bitcoin withdrawal only took 22 hours from request to hitting my wallet, which is very good. I’ve had other sportsbooks take up to 72 hours for Bitcoin. That’s sort of a first-world problem, as any of those times are excellent for American players, but sportsbooks have come far enough with Bitcoin to allow for pickiness. Very few players are going to sign up at 5Dimes because of their casino. It’s there mostly to try to catch sports bettors looking for quick action when there aren’t any games available. 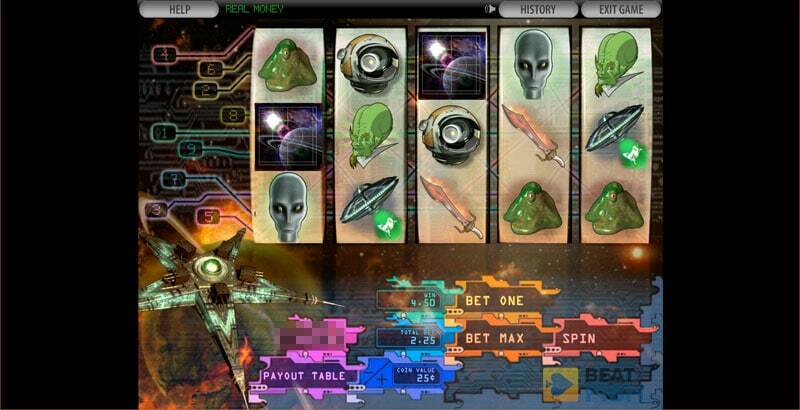 However, the 5Dimes casino is fairly expansive, with games from Real Time Gaming and Betsoft. There are at least 50 slots, several video poker variations, Blackjack, Roulette, Craps, Pai Gow, Red Dog, Keno, and scratch cards. The table games are functional, but have very simple graphics. A number of the slots look very dated, with many requiring Flash to play. The 5Dimes casino has a surprisingly high number of games from both Betsoft and Real Time Gaming. 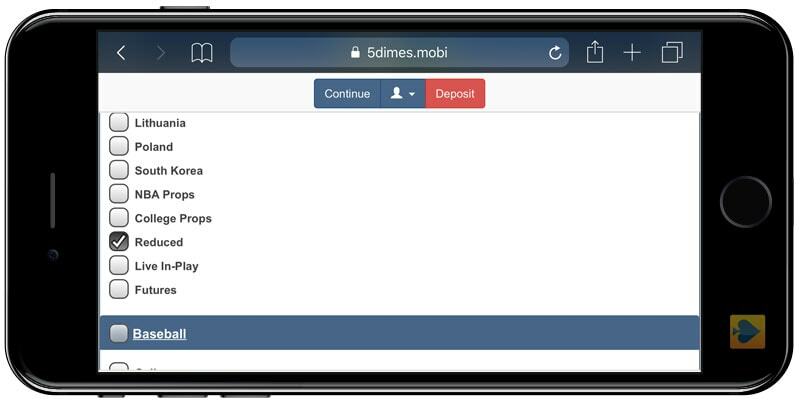 Many of the casino games can be played on the 5Dimes mobile site, but you’ll also have to open each game multiple times because of constant errors or broken links. 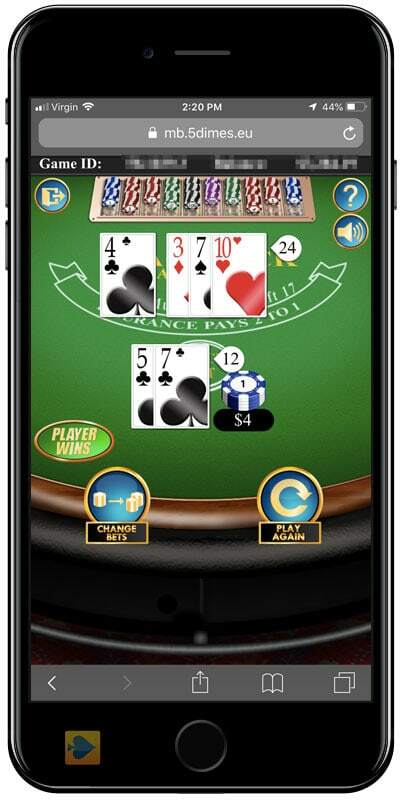 Some of the 5Dimes casino games work really well on mobile and are formatted for the small screen, such as Mini Blackjack. 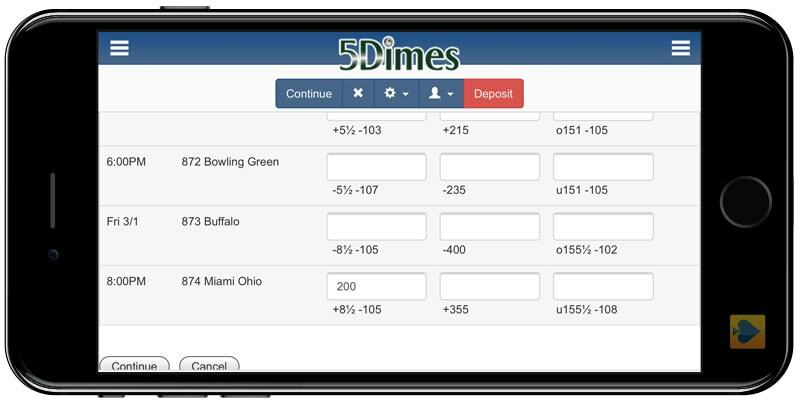 5Dimes also doesn’t use a shared cashier between sports, casino, and poker, meaning you’ll have to manually transfer funds to the casino from your sports balance before playing. A number of casino games don’t draw right from your 5Dimes cashier, meaning you’ll have to make a quick transfer to the casino first. What do those names mean, though? 5Dimes doesn’t clearly explain it anywhere that I could find. 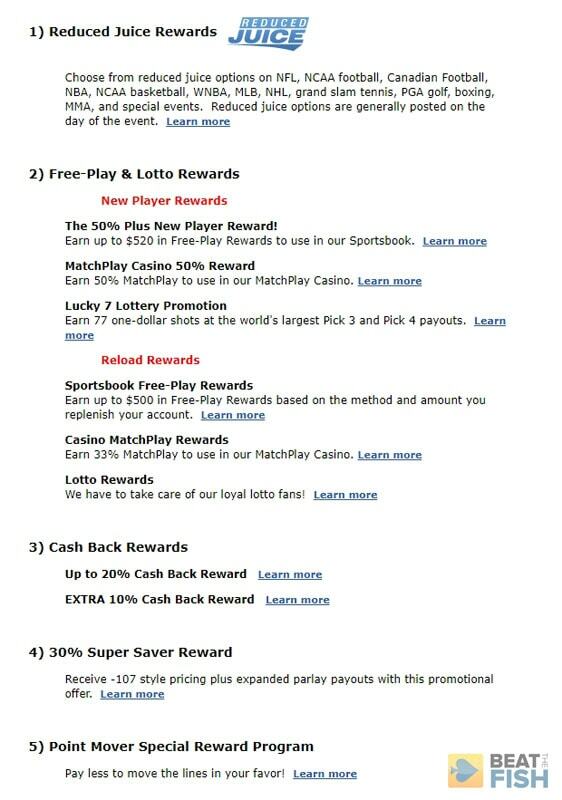 The Match Play Casino is self-explanatory in that if you take a casino match play bonus, this is where you can use it. It also seems that each section has games from a different developer, I’m not certain about that. The 5Dimes casino is confusing to navigate and doesn’t have the most cutting-edge graphics. 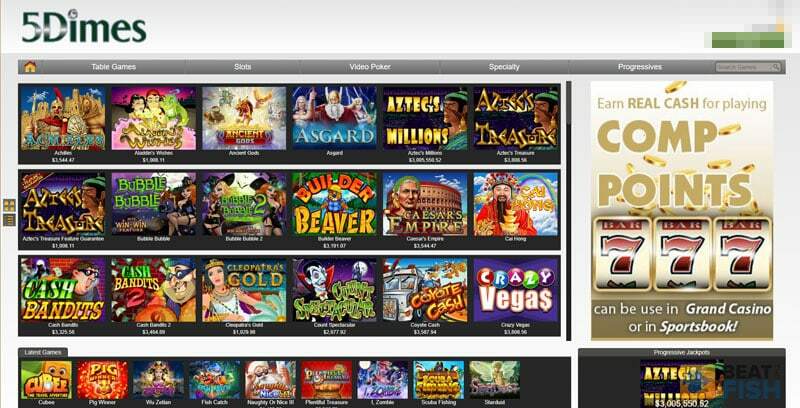 Each 5Dimes casino section has a slightly different game selection and interface. It just feels cluttered and unnecessary. Worst of all, I’ve never been able to access the Grand Casino, which is what 5Dimes does most of its casino promotions on. 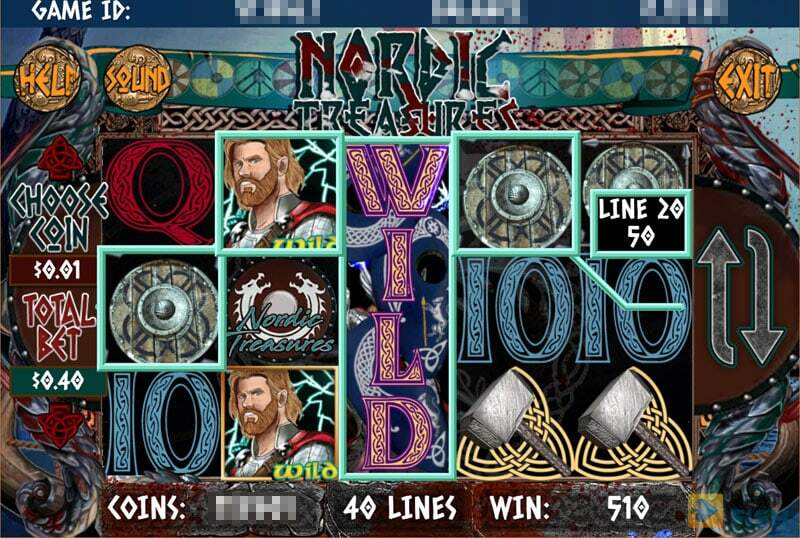 There are a number of basic-looking video slots at 5Dimes, such as Nordic Treasures. Whenever I try, 5Dimes prompts me for a different login and I have no idea what it is. I tried using my main 5Dimes credentials and they failed. I used the Forgot Password link and I was never sent an email. The other casino sections worked, so I just gave up on Grand Casino. It’s safe to say that the 5Dimes casino is a hot mess. I’m not sure it’s possible to make a more drab video slot than this one. Although most players go to 5Dimes for sportsbetting, they have a surprisingly full-featured live dealer casino. Despite the slots and table games section being confusing, the live dealer section is well done, with live Blackjack tables regularly filling up to capacity. I give 5Dimes a lot of credit for offering a live dealer casino section, something even a lot of dedicated US-friendly casinos don’t have. I’m actually quite impressed that 5Dmes has a live casino section at all, which is in its own navigation tab, away from the cluttered main casino section. The majority of USA-facing casinos still don’t offer a live dealer casino because it’s difficult to find live game providers that work with offshore sites. 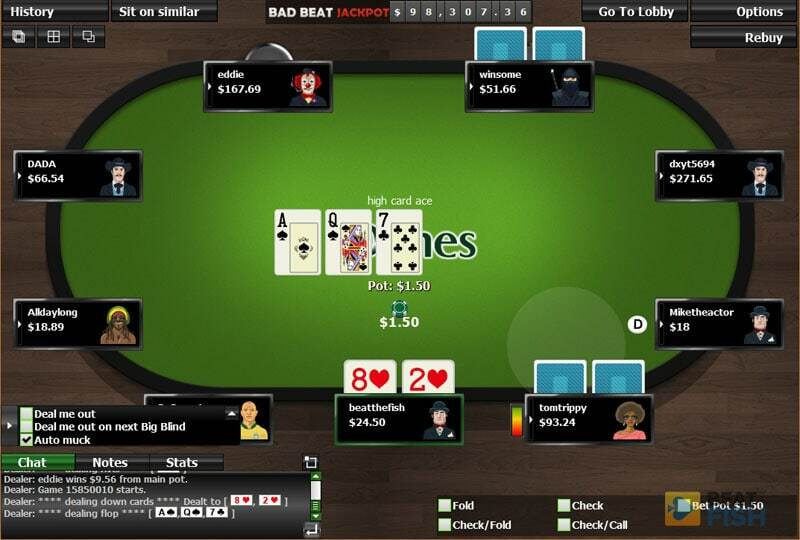 It adds a little entertainment when you get a 5Dimes live dealer with some personality. This Blackjack dealer would cheer for everyone when he busted. 5Dimes has live Blackjack, Roulette, and Baccarat. I usually find 3 or 4 Blackjack tables available, with a minimum bet of $5-10. 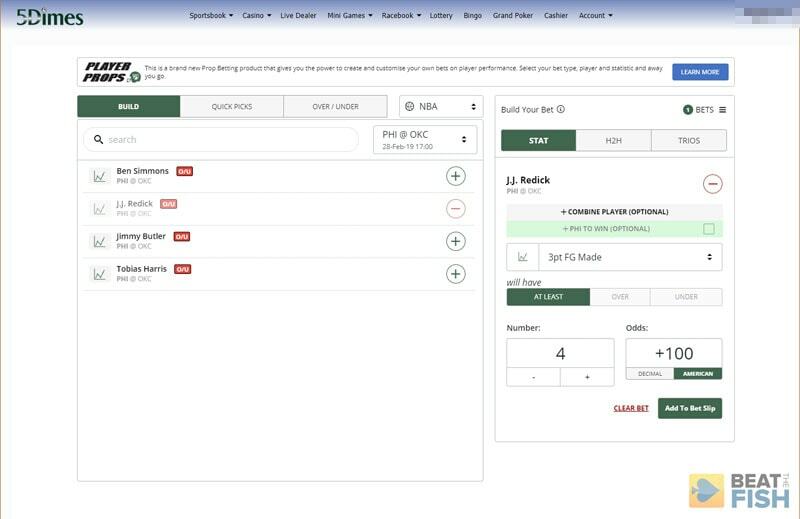 You can see a preview of your dealer before selecting a table. The Blackjack tables are usually filled or close to filled, which is fun. 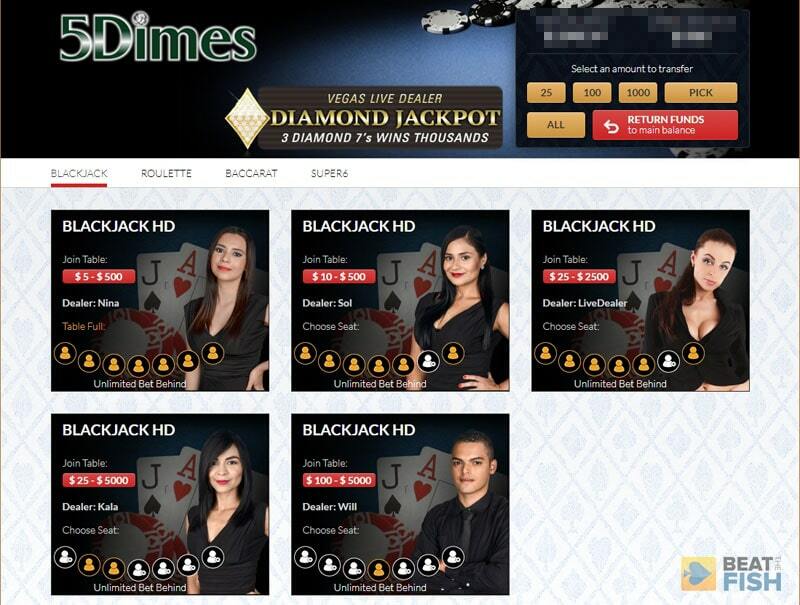 5Dimes is one of the only US-friendly gaming sites to have a live dealer casino. Live Roulette allows bets as small as $1, but can allow a lot of players at a single wheel. Live dealer Roulette games allow for lower minimum bets and more players. 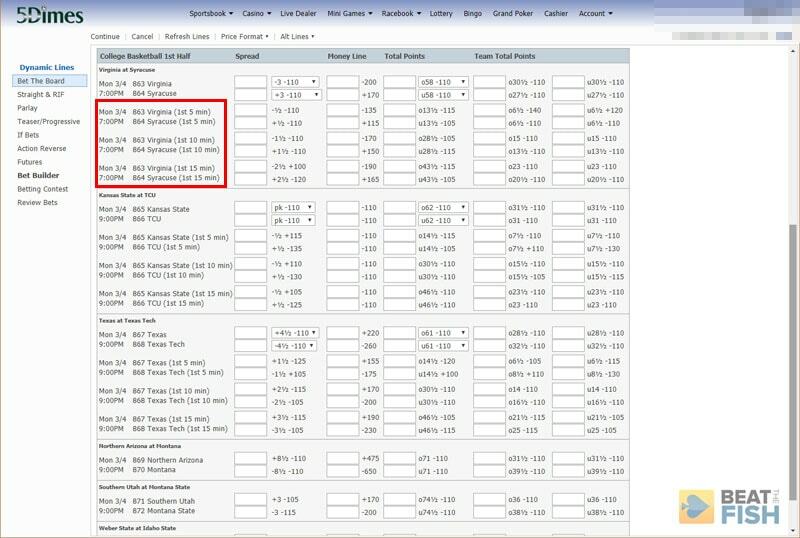 5Dimes incorporates the Bet Builder system, which I’ve seen at a few different sportsbooks. It’s an incredibly robust system for player props that’s unmatched by the traditional list of prop bets. With most sportsbooks, you’re still relying on the book to make the prop you want and you can’t adjust them. It’s take it or lose it. Sportsbooks are great on this for the Super Bowl, but not so much the other 364 days of the year. I’m not the biggest prop bettor, but I’ve occasionally gotten a tip on a specific player’s stats and not been able to bet on it. With Bet Builder, you can make your own props and adjust any standard set props. The Bet Builder section at 5Dimes is incredible for player props, allowing all sorts of customizations. For example, you can select any game and take a look at the player props for almost anyone in the game. What’s cool is you can see the different odds on different prop lines. The odds are usually terrible (think -400 or worse) to make props even a little bit easier to attain, but can jump quite a bit (+150 or better) if you think a player will have a bigger game than the set line. You can build your own props at 5Dimes with almost any player and almost any stat. The other part is just making up obscure props for yourself and Bet Builder will set the odds for you. Sportsbooks don’t always lay lines on every player for multiple stats, so here’s your chance to do that. It’s a sharp system that is pretty much the ultimate way to bet player props. To me, a perfect mobile option should be the top priority of any sportsbook who wants to compete these days. Most sports bettors at 5Dimes aren’t at a computer when they want to make a bet, either attending a game, watching at a bar, are on a work break, or are busy with family/life. Making normal bets at 5Dimes works fine, although it’s always challenging to view so much data on a small screen. Turn your phone sideways to see all the Reduced odds on one screen. Sports bets should be simple to execute from your phone, only taking a minute of your time to place a bet and be done with it. As with most other aspects of their site, the 5Dimes mobile site isn’t pretty, but it works fine. 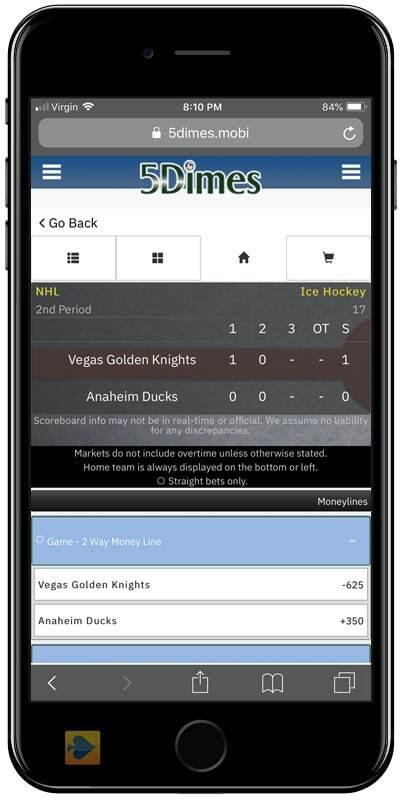 Once you log in from a mobile browser, you’ll see the familiar Sportsbook Main section. You’ll see every line that you would on a desktop. After you select your sports, I highly recommend you turn your phone or tablet sideways to landscape mode. That way, you can see every betting box on one screen. If you don’t, you’ll have to scroll sideways to see totals. I like the pending wager section at 5Dimes more than a lot of books that make it difficult to make out exactly what you’ve won, lost, or are still waiting on. 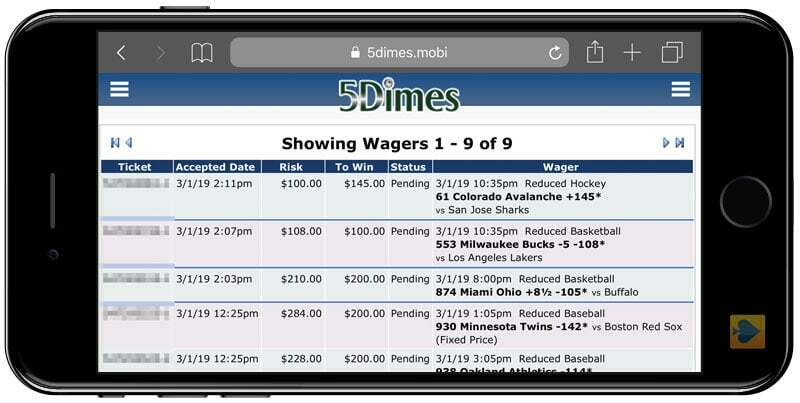 I never have trouble placing a standard sports bet at 5Dimes on mobile, but things get dicey if you want to place a live bet or use the casino. 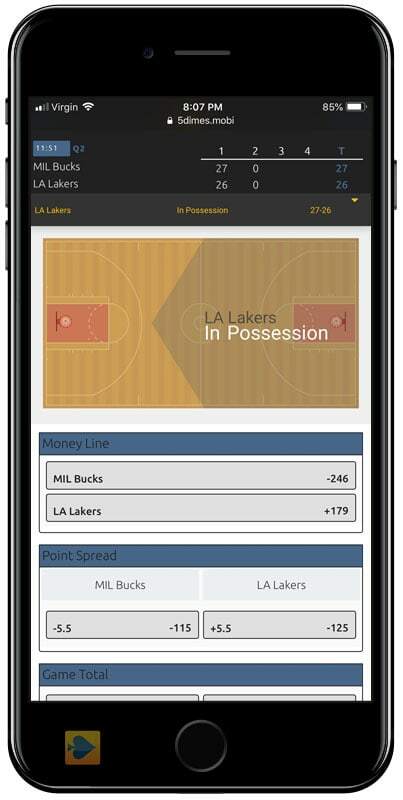 The prop Bet Builder seems to be developed more recently than the rest of the sportsbook, designed perfectly for mobile. I can rarely connect to either live betting format on mobile the first time I try. I get numerous errors and have to click it again in the menu multiple times to get live betting to load. 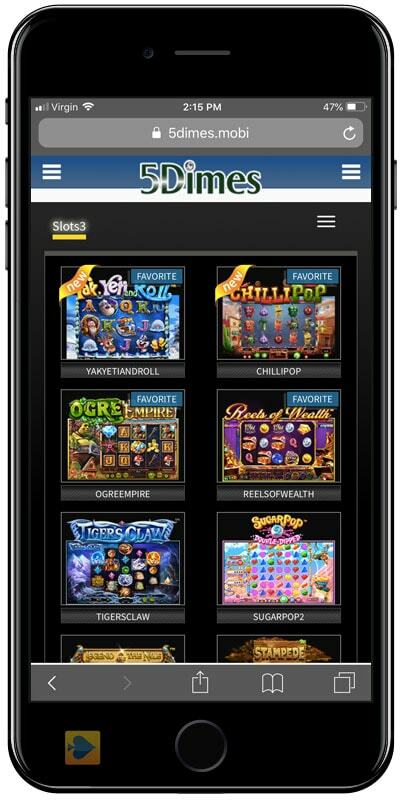 Casino games don’t look perfect on mobile, but most of them are still playable. To the credit of 5Dimes, if I try live betting on mobile the next day, it might work without a hitch, so it seems like they’re aware of errors and fix them quickly. I do still find the mobile live betting interface pretty unwieldy, even when it works. Most of the slots from the 5Dimes casino work well on mobile, even if they aren’t perfectly optimized and give you occasional errors. 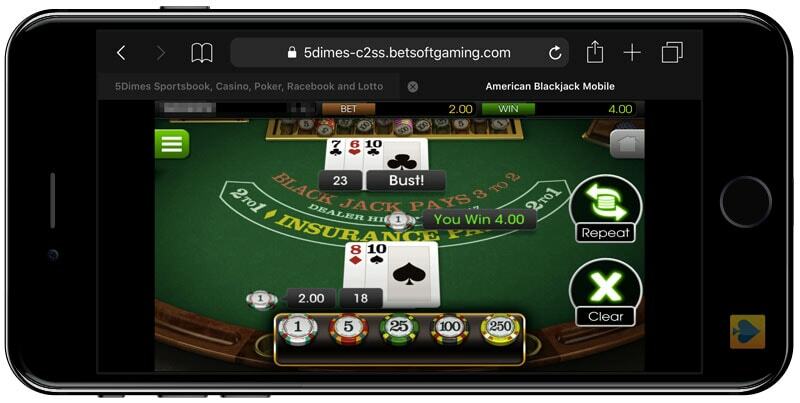 As for the casino, 5Dimes does support mobile play right within your browser, but it isn’t reliable. Each game takes at least 15-20 seconds to load and you’ll often be greeted with an error screen after waiting. The Mini Games section of the casino works a lot better on mobile, likely because it doesn’t rely on Flash. 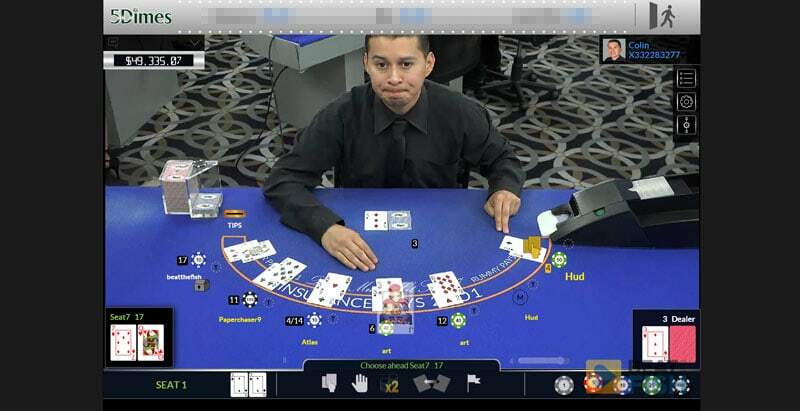 Table games are designed in portrait orientation, so you won’t have to turn your device for things to look right. Loading times are much snappier and slots run a lot smoother. My advice? Stick to straight sports bets in the Bet the Board section on mobile, as they’re the only part of the 5Dimes mobile site I find reliable. I like that 5Dimes includes the cashier on mobile, supporting full access to every deposit and withdrawal method. The Betting Contest is a simple picks contest that adds a little entertainment to your usual betting. It’s free to enter each day and you can win between $50 and $1,000 in Free Play money at 5Dimes for going on a win streak. In the main sportsbook window, you click on the Betting Contest link on the left column navigation to enter. How the betting contest works is 5Dimes selects a number of games each day for you make a pick on. You then need to place a real-money wager of $50 within 24 hours of making that pick to “activate” the winning streak. The nice thing is you almost need to place that bet once at the start of each winning streak in order to qualify. You don’t have to bet each time to continue your streak. The Betting Contest is an entertaining way to possibly win some free plays. Don’t forget it’s there in under the main 5Dimes Sportsbook navigation drop-down. Also, the best streak every month will get a $1,000 Free Play. Seeing as the best sports bettors in the world will win 60% of the time, it’s tough to go on that kind of streak. 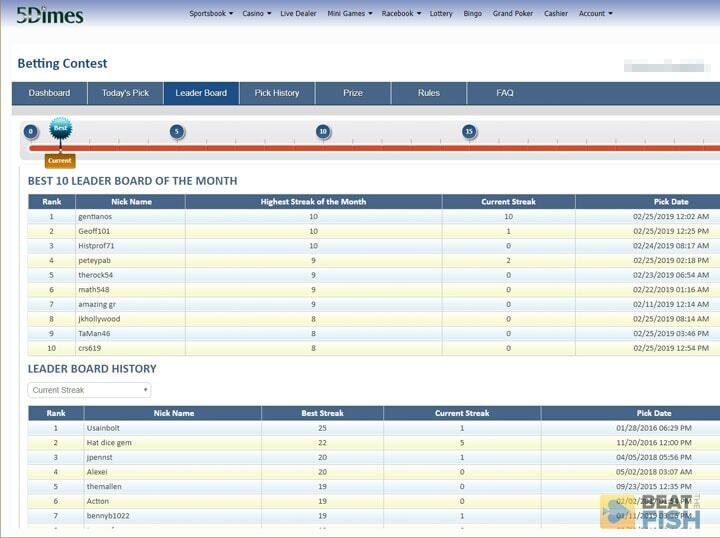 The leader board shows than around 2 or 3 players hit 10 in a month and around 20 or 30 hit 5. It’s free if you’re already betting and you have a chance for prizes, so I just view it as a fun add-on. The massive winning betting streaks are rare, but they do happen. Usually 1 or 2 players per year hit the 25 straight win reward at 5Dimes. 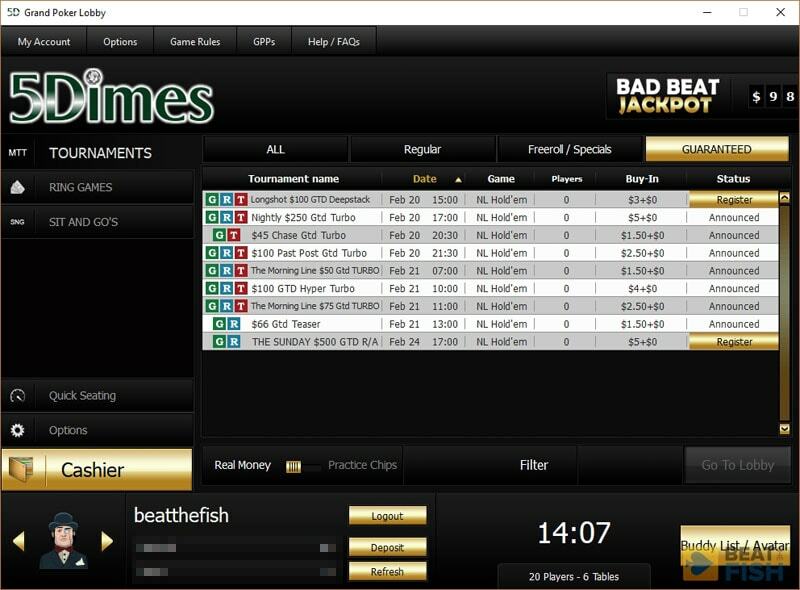 When it comes to online gambling, I’ve been primarily an online poker player for the past 15 years, so I took a keen interest to how good the poker was at 5Dimes. Even though there are several strong choices for real-money poker for American players, I still have an eye for hidden gems. Who doesn’t love a gritty underdog? I’m glad 5Dimes gives another online poker option for USA players, but you can see that traffic is the fatal flaw. One of the biggest perks of smaller poker sites is that they often have some of the loosest players. There are fewer games, but that usually means that experienced sharks aren’t even bothering to play there. 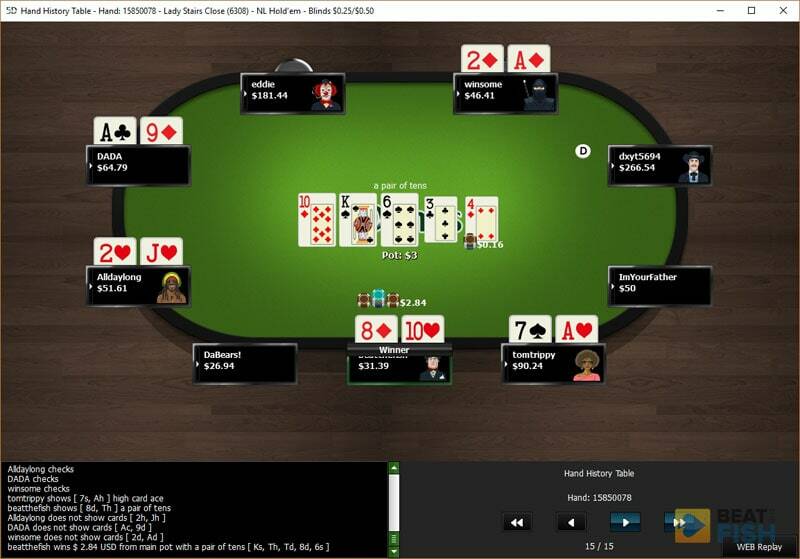 5Dimes Poker, which they call Grand Poker, is serviceable, but feels like a token effort simply to say they offer multiplayer poker. The small player base seems soft, but there are rarely more than 20 or 30 active players. 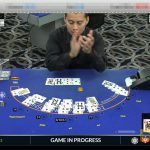 The few games that do run at Grand Poker are usually quite soft, with this sort of communal trash-hand pot coming up quite often. How does 5Dimes poker score? 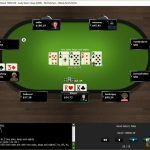 5Dimes calls their poker section Grand Poker and it fits the outdated design scheme of the rest of their site. 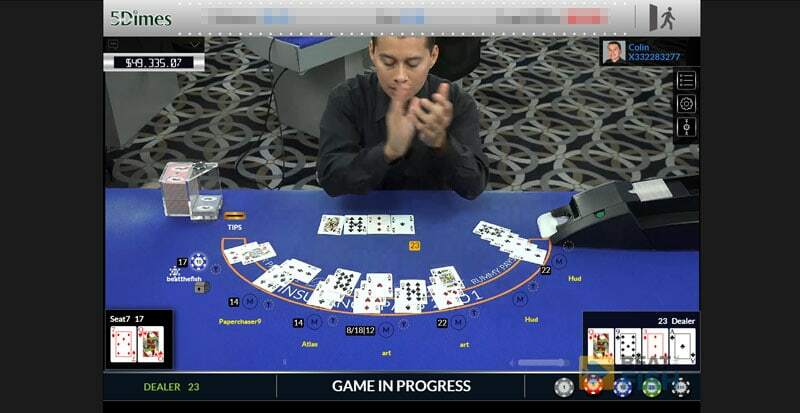 Grand Poker requires a download on a desktop as they do not have an Instant Play no-download version. 5Dimes also does not have mobile poker software. 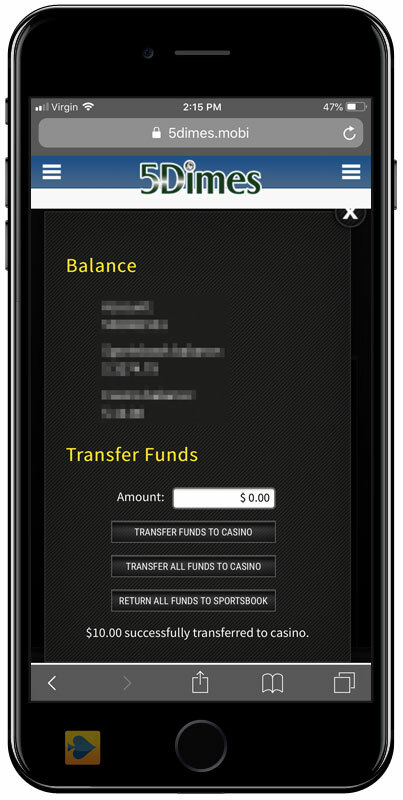 After you download Grand Poker, you also need to manually transfer funds to poker from your sportsbook balance. It’s instantaneous going to and from your poker balance. 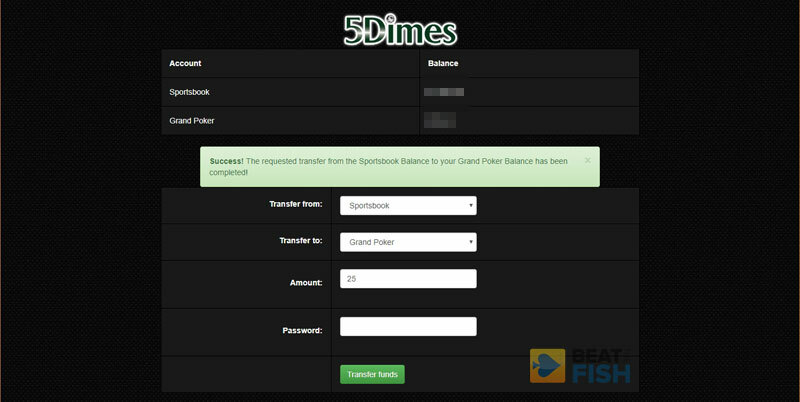 Similar to the casino, you have to make a transfer from your 5Dimes sports account to Grand Poker in order to play. Opening 5Dimes Grand Poker, the software looks about 15 years old. The user interface feels dated and the table is complete with 15 or so low-res cartoon avatars players can choose from. As a veteran poker player, I think software is largely overrated. I couldn’t care less about what it looks like so long as it works reliably and there are quality games available. Still, it’s a little jarring how old Grand Poker looks. 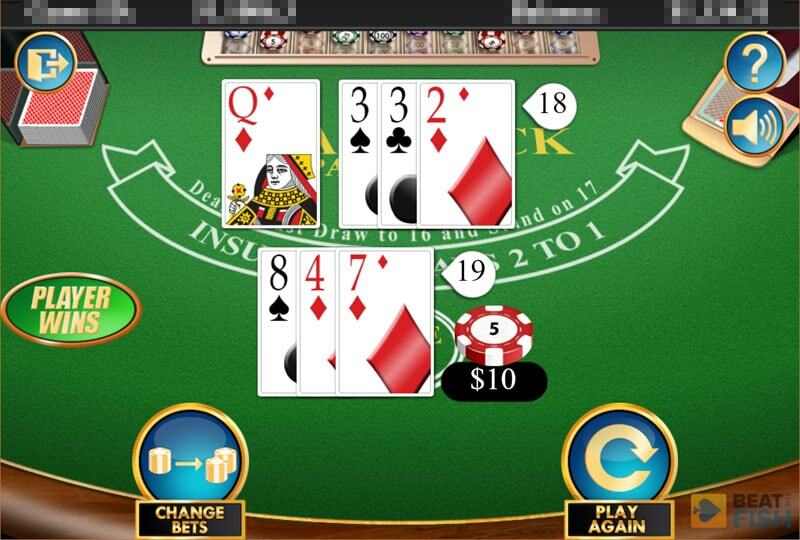 I do like some of the Grand Poker software options, such as a number of card graphics visual customizations. 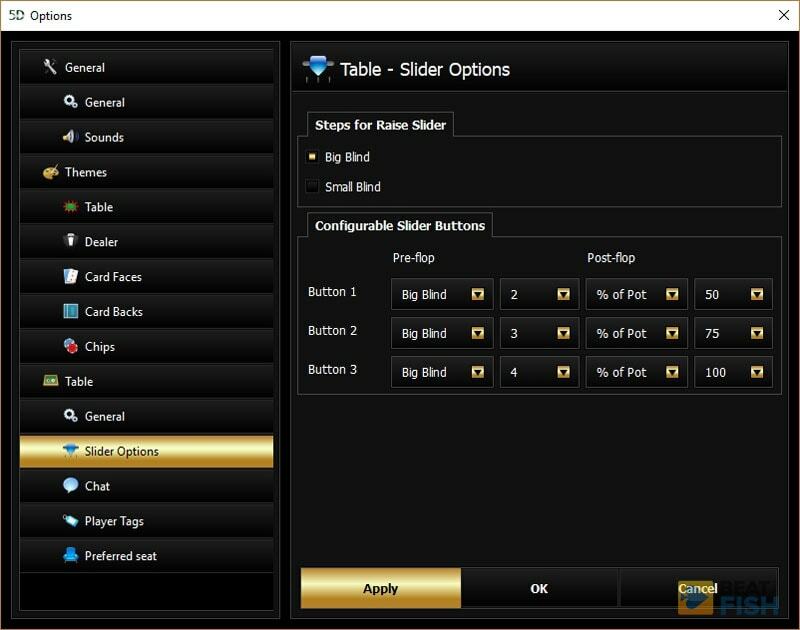 The Grand Poker software feels very dated, but one feature I really like is the ability to customize betting buttons to pre-set amounts. My favorite feature is the ability to customize the size of your bets pre-set into the bet slider. I don’t remember seeing that anywhere else. 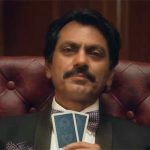 How are the actual poker games? I enjoyed the Grand Poker game quality quite a bit, meaning I found the players to be inexperienced and willing to gamble. I found players to either be by-the-book and easy to read or loose-passive, meaning you can simply bet for value and expect them to call you down with weak hands. Even though there aren’t a lot of cash games going, the Grand Poker competition is very beatable overall. 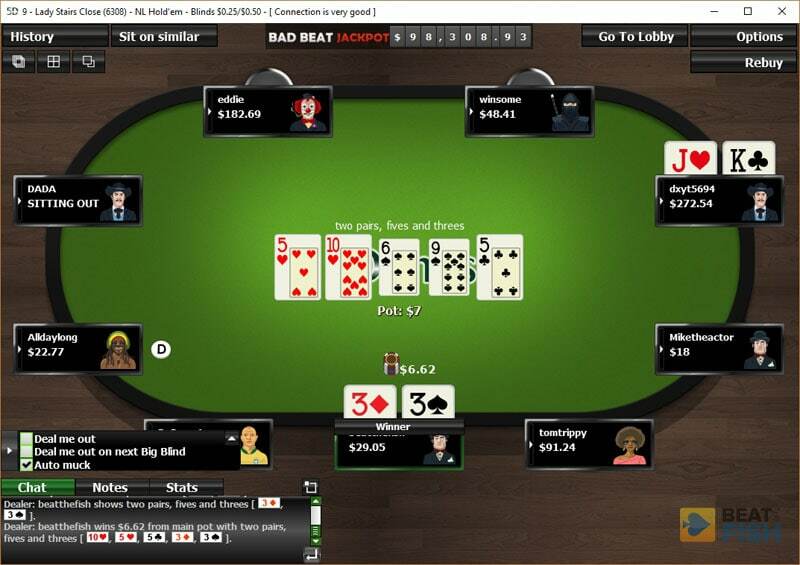 Pots are often communal and passive, with many players willing to play pre-flop for the minimum and just check it down if no one hits. It’s clear that Grand Poker players are, on the whole, not experienced players. Both flop percentages and average pots are above-average, which usually have a strong correlation to loose games. Average pots range between 20-40x the big blind and flop percentages 25-40%. Both are numbers you want to see for action-packed games. Unfortunately, there are rarely more than 40 or 50 active real-money players at any one time at Grand Poker. Average game speed is below average, unfortunately, with full 9-seated cash games averaging about 50 hands per hour and shorthanded 6-seated cash games running at 65 hands per hour. I mostly enjoyed my time with Grand Poker, thanks to beatable games, a smaller community atmosphere, and nostalgia-tinted software only a mother could love. So why can’t I recommend Grand Poker as a serious contender for US poker players looking for an beatable alternative to the big guys? Unfortunately, Grand Poker isn’t available on the 5Dimes mobile site, which fits in with the old-school feeling of the software. The traffic is some of the lowest in the market, sadly drawing only 20-50 total players. 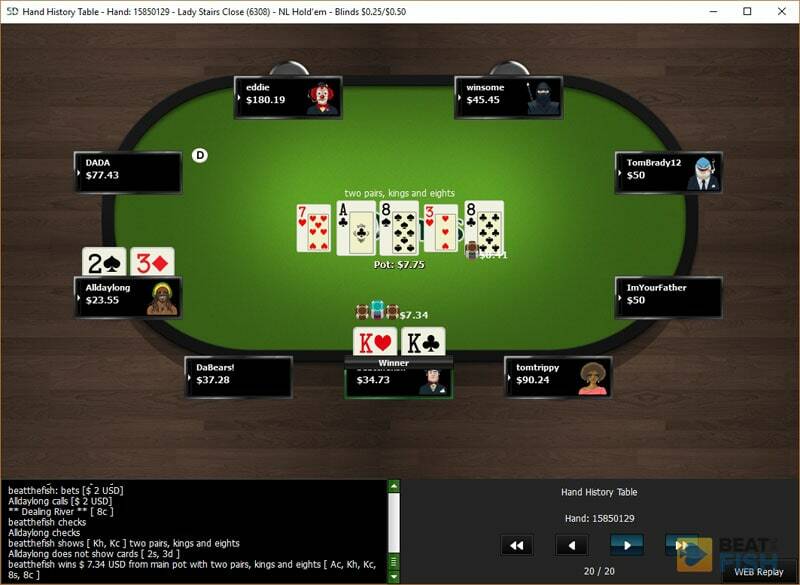 Even during peak hours of the EST evening, you’ll probably only see 3 or 4 filled cash games. Occasionally, you can find a Grand Poker NL Hold’em cash game filled at $1/2, which can be a hidden profitable gem for medium-stakes players. I do give credit that one of those games usually goes up to the $1/2 level, so you can at least put a couple hundred dollars on the line. Grand Poker can certainly serve as your secondary (or third) poker site as a profitable change of pace to your main home. 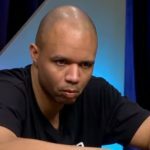 However, serious poker players will be hard-pressed to even find more than one table to multi-table at their preferred stakes. 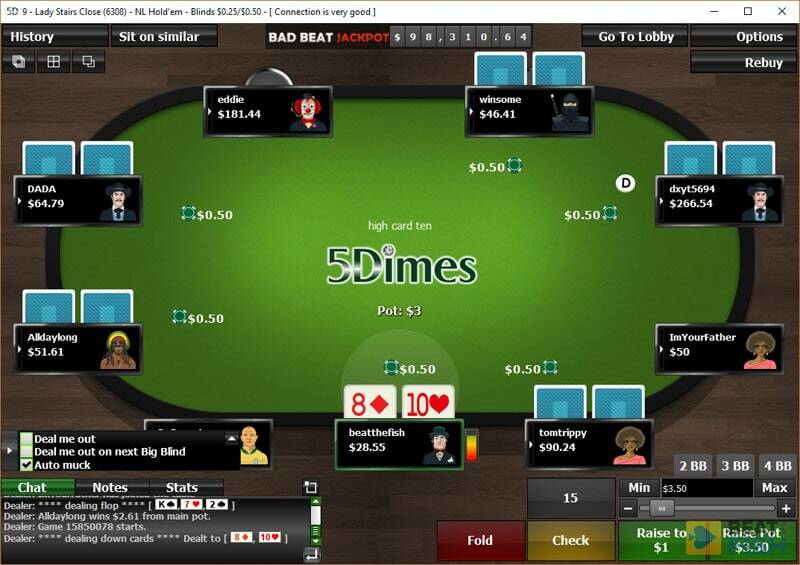 5Dimes has the right idea for Grand Poker tournaments, offering regular guarantees and freerolls. The problem is that the guaranteed tournaments have the lowest prize pools I’ve ever seen. Kudos to 5Dimes for trying to offer guaranteed tournaments, but the prize pool is some of the lowest you’ll find anywhere, complete with re-buys and add-ons. Most Grand Poker tournaments have a pitiful $50 guarantee with a $3 buy-in. Adding insult to injury, rebuys are allowed. That means that Grand Poker expects only 10 players or so to show up, making them little more than scheduled Sit & Go’s. Speaking of Sit & Go’s, there are never enough players to fill one up, so they sit unused. Sit & Go’s sit around unused at Grand Poker because there just aren’t enough players willing to fill them up. Grand Poker also has regular $50 freerolls, which could potentially draw a lot of players to the platform. Unfortunately, freerolls are only open to those earning thousands of Grand Poker Points, which come through regular gameplay. There are very few poker regs here, meaning these freerolls also sit empty and unused as it takes 5 registrations to start. One nice thing Grand Poker has added is a weekly $500 freeroll without restrictions. These take place every Sunday at 10 P.M. EST and everyone can enter. 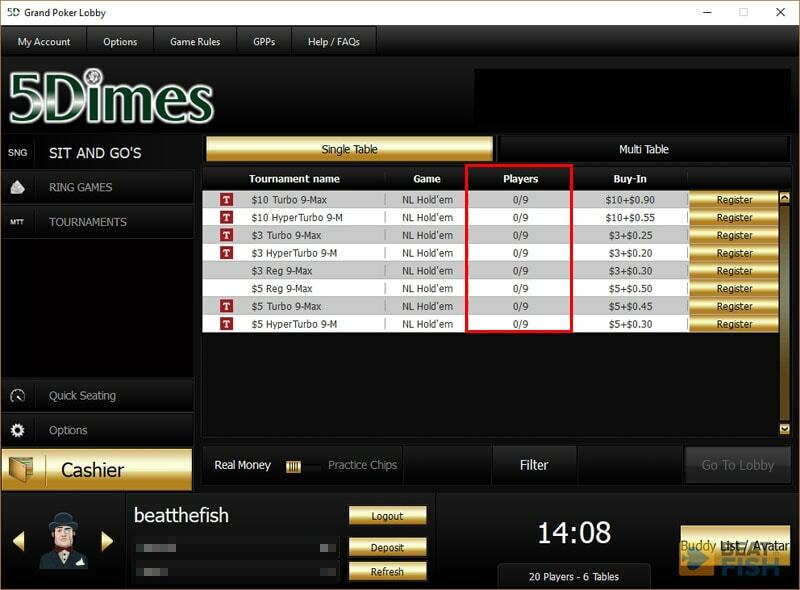 Surprisingly, that makes it the biggest unrestricted freeroll for USA players. 5Dimes has a really interesting lottery system, which I haven’t seen elsewhere. 5Dimes doesn’t run their own lotto, as I figured, but actually pays out on the real US state lotteries. Granted, it’s only pick 3 or pick 4 with a maximum payout of $9,000, but 5Dimes has hit on a pretty cool idea: offer online tickets for every state lottery. They also pay out more on a winning pick than the actual state lotteries. The 5Dimes lottery is an interesting idea, with them awarding jackpots based on real state drawings. How it works is you choose if you’re doing a pick 3 or pick 4, choose your numbers, and then which state(s) you want to play. The winning numbers are then determined by the official drawings for each state. If you’re into playing the small lottery jackpots, this is a way you can play it without having to go somewhere in-person. The lottery is confined by Pick 3 or Pick 4, but the payout is also much higher than the official state lotteries for them. I give 5Dimes credit for offering my trifecta of player support: email, live chat, and telephone. Telephone support is a tougher one to come by, so props to them for that. How does the support actually perform, though? I’ve used the live chat a couple of times and, aside from some minor grammatical errors, they were helpful. They seemed knowledgeable about some several bonus questions. 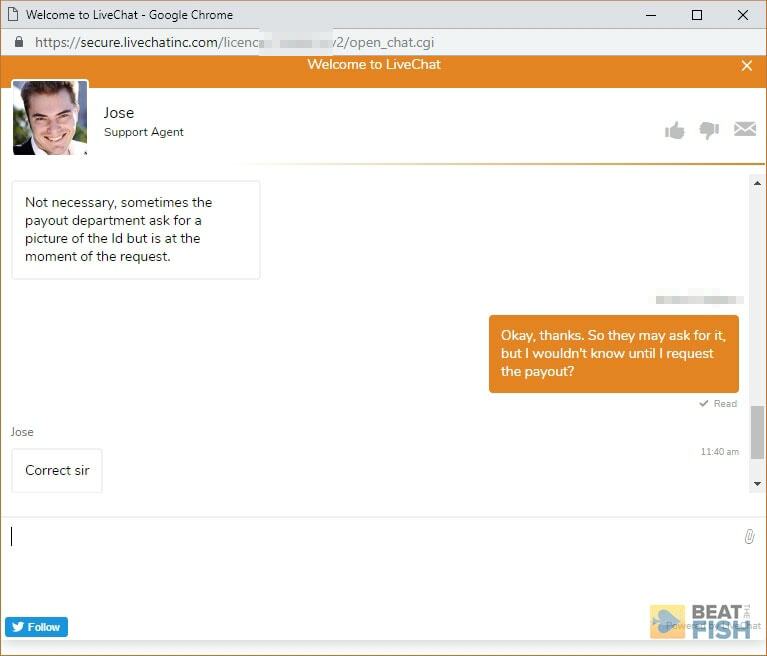 5Dimes always has Live Chat available as well as several different phone numbers. Although they gave me one chat answer of “you’ll have to see when you ask for a payout” in response to a payout question instead of actually answering it, I think the support knowledge is above-average from what I’ve experienced elsewhere. Note: Bet Sync is currently not working. 5Dimes still supports it, but The Action Network pulled the rug out from under players without warning, disabling this feature. Responding to player complaints, The Action Network claimed this feature was a Beta test that had concluded. You can still manually input your 5Dimes bets into the app, but it will no longer automatically sync for you. It’s unclear if it will ever return. There’s speculation that The Action Network was under pressure to stop cooperating with offshore sportsbooks like 5Dimes. Even though I like to tease 5Dimes about their antiquated design, I appreciate some modern touches they’ve incorporated. The most handy to me is that 5Dimes syncs with The Action Network app to track your bets. The Action Network is the most popular sports betting tracking app and it’s perfectly designed for bettors. The Action Network is a great app for tracking sports bets, but they no longer sync with 5Dimes or any other online sportsbook. I have no affiliation with The Action Network, but I’m a big fan of its functionality. 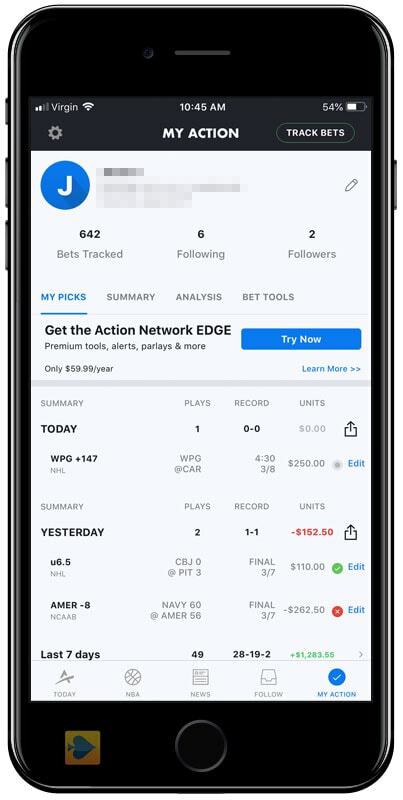 Instead of checking your ESPN app or other sports app for scores of games you’re betting on, The Action Network shows shows every score along with live progress of your current 5Dimes bets. 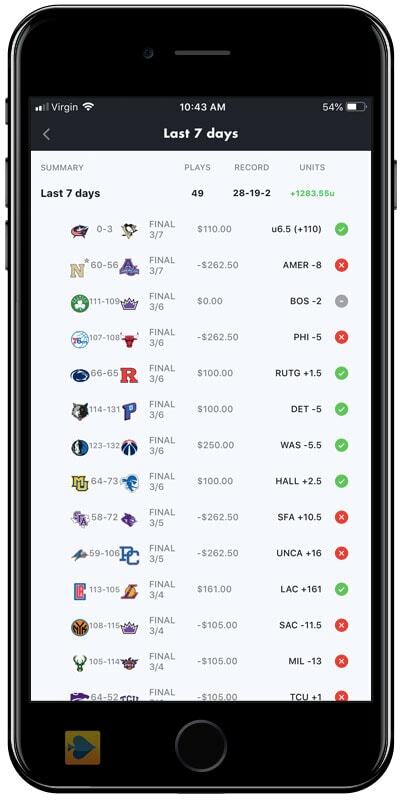 It’ll show you the probability of your bets winning or losing, updates lines for every game, and track both your daily bet results and long-term winnings at 5Dimes or any other supported sportsbook. 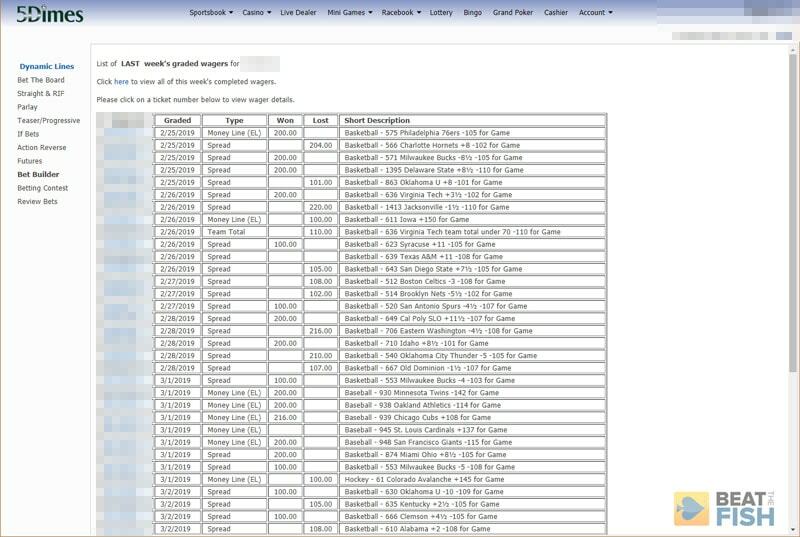 It’s free and it’s perfect for sports bettors, eliminating the need to remember the spread for every game you check. 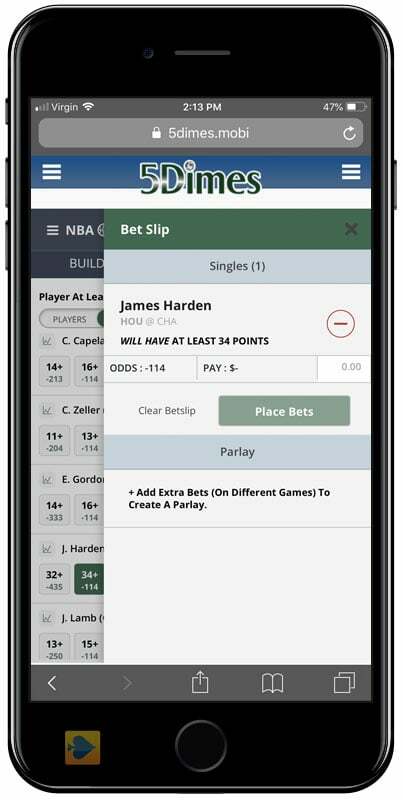 You can easily track all of your 5Dimes bets with this app, which displays both live and historical data. 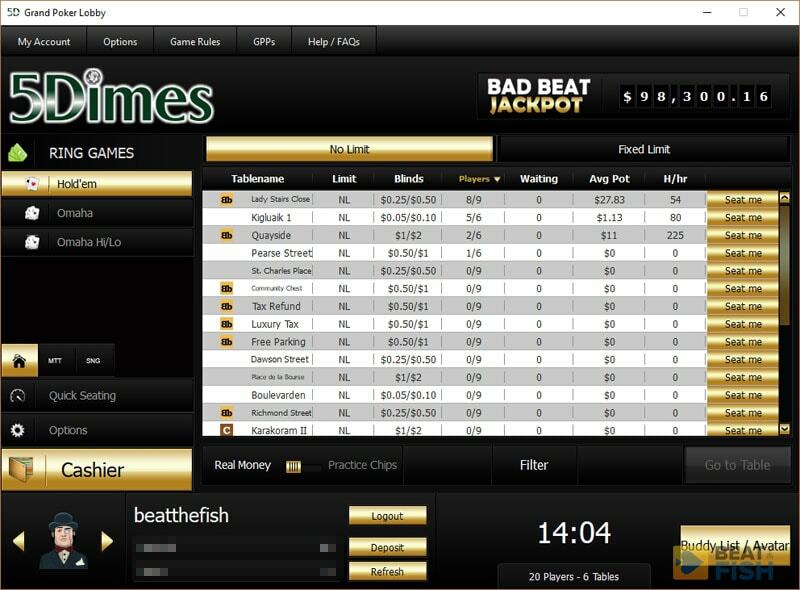 With Bet Sync, just sign in to your 5Dimes in The Action Network app once and it will start syncing your bets. Every time you place a bet on the 5Dimes site, it will show up in the app within seconds in the “My Action” section. You can then keep an eye on your bets just by opening the app. 5Dimes earns my place as the best online sportsbook open to USA players. The website is dated and mobile live betting doesn’t work great, but their reduced lines just can’t be beaten anywhere. 5Dimes also specifically markets to professional sports bettors, which is the exact opposite of what most sportsbooks do. Although there are isolated player disputes, 5Dimes has an excellent reputation of paying out winning players without hassle. The number of sports and events you can bet on at 5Dimes is unrivaled. 5Dimes isn’t perfect, but I think they do the most important things better than anyone else: offer the most lines, the best prices, and quick Bitcoin payouts without scrutiny. They were my favorite book before I made this review and, so long as they keep Reduced Juice and pay out on time, they’ll continue to be.